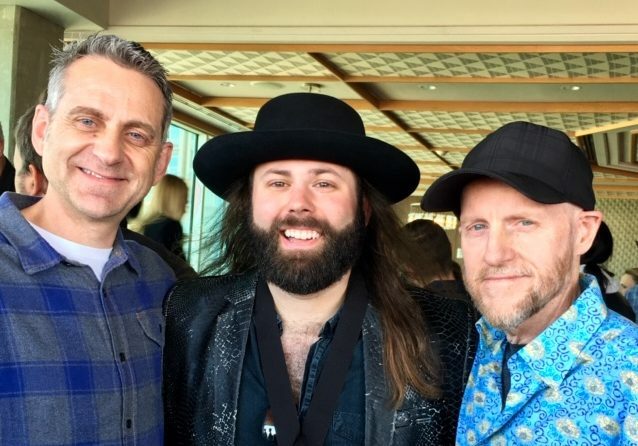 CJ Solar pictured in the middle with Curb College songwriting faculty Drew Ramsey and James Elliott. CJ Solar, a Belmont songwriting graduate, was recently featured in Music Row Magazine for co-writing his first No. 1 radio single, “Up Down,” featuring country music artists Morgan Allen and Florida Georgia Line. To celebrate the song, ASCAP and BMI hosted a party to honor the record’s artists and songwriters on Wednesday, Oct. 17. Michael Martin, ASCAP vice president of membership group nashville, offered congratulations to Solar by presenting him with an ASCAP-branded YETI cooler. After interning for Sea Gayle Music, an independent music publishing company in Nashville while studying at Belmont, Solar was signed to a publishing agreement with the company. Solar has been named as one of the “New Artists You Need To Know” by Rolling Stone Country and has also recently premiered his single “American Girls” music video on popculture.com.